Apple Music will cost $9.99 per month in the United States after a three-month free trial period, but the service may have lower pricing elsewhere. A sign-up menu for Apple Music that started appearing yesterday for some developers and public beta testers on iOS 8.4 beta 4 reveals that the subscription-based streaming music service could cost as little as $2 to $3 per month in countries such as India and Russia. 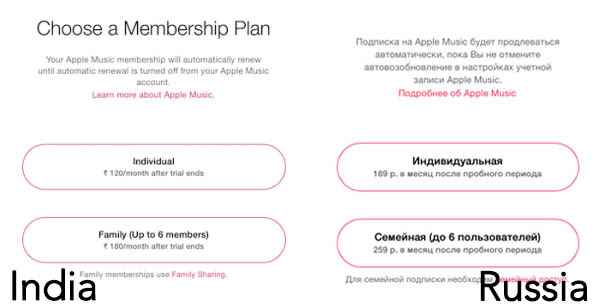 A pair of separate reports by Technology Personalized and Russian-language tech blog TJournal share screenshots that suggest an Apple Music individual subscription could cost Rs 120 per month (~$2 USD) in India and 169 rubles per month (~$3 USD) in Russia. While the lower prices in these countries are not confirmed beyond these screenshots, they would be in line with similar pricing offered by rivals such as Rdio, Guvera and Gaana. Apple Music was announced earlier this week as a streaming music service, live global radio station and social platform for artists to connect with fans. The subscription-based service will be available for a monthly fee after a three-month free trial for iPhone, iPad, iPod touch, Mac and PC. Apple TV and Android versions of the service will be available in the fall. Apple Music launches June 30 on iOS 8.4 and iTunes. The appeal of $9.99 is the number of digits. The human brain is much better at processing how many digits something is then what the value of those digits are. The brain sees the difference between $10.00 and $9.99 as huge compared to the difference between $9.99 and $5.99, for example, despite the price going up by only 1 cent and $4, respectively. So Apple goes with 9.99 because it's about the same as 5.99 according to the human brain (so just as many people will sign up at either price), while resulting in 60% extra revenue. My brain thinks 5.99 is way cheaper. Yours must be broken. If you cancelled it after one day, depending on the size of your music collection you never had a chance to experience it correctly. I've got about 75 Gb of music and it took the better part of a week to match my collection. Frustrating at first but I'll never get rid of it. EVERYTHING I own streams at the drop of a hat without issue. I'm not interested in Apple Music. Not after I subscribed to iTunes Match. I cancelled it after 1 day. That's how terrible it was. my VPN sub is gonna pay for itself in just a few months! Apple really does think that swapping the $ to £ is how to come up with the UK price for any of their products or services. From the article it seems they are matching existing services locally. So the UK price matches Spotify, Rdio, etc. Yep, some of the prices are inexplicable. Sometimes factoring tax brings it close. But others it's just way off. Supply and demand I guess. Is there anything you do like about Apple? You don't like iTunes Match. You don't like Apple Maps. You apparently won't like Apple Music. So what do you like about Apple that brings you to these almost illustrious forums? It is stupid to compare the $ price from the US with the converted $ price in India. People in India earn less, but things also cost less. They need less $ to have a similar standard of living, e.g. if you convert the price of a loaf of bread into dollars it is only $0.35 compared to many many dollars in the US. But that does not mean it is way cheaper for people in India even though the $ amount makes it sound like. Apple needs to adjust the price accordingly and the contracts with music labels probably also take that into account.